WHEN THIS HARVARD MBA’S GRADUATION SPEECH WENT VIRAL, HE FOUND A NEW CAREER MISSION. 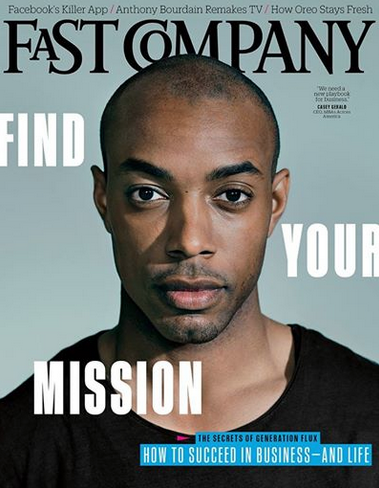 When Casey Gerald woke up on the morning of his graduation from Harvard Business School this past May, he had a bad feeling. As a child, Gerald’s parents had abandoned him, first his father, who had a drug problem, then his mother, who was bipolar. Gerald knew that trouble always lurked, punctuated by the memory of gun-toting thieves who broke into his apartment while he slept a few years earlier, threatening to kill him, and only fleeing at the last moment when the sound of police sirens approached. But this day would not end with disappointment. Gerald, who had made his way to Yale undergrad before HBS, had been chosen by classmates to deliver the student address. And he went on to deliver an inspirational speech that became a viral phenomenon, viewed more than 100,000 times. Gerald’s mission as a kid was survival in inner-city Dallas, living with relatives, friends, and his older sister. “We were like the Boxcar Children: on our own,” he says. He stayed positive. He was plenty smart, played football in high school, and eventually made his way to Yale. He had a job lined up at Lehman Brother for after graduation, but the firm imploded. He tried his hand at a public policy nonprofit in D.C; worked on an unsuccessful gubernatorial campaign in Texas; and explored the New York City startup scene “living on tuna fish and peanut butter,” as he puts it. IT CAN’T BE ABOUT HIERARCHY, LEADERS SITTING IN THE CORNER OFFICE AND GOING TO THE HAMPTONS WHILE EVERYONE ELSE IS PRESSING SHEET METAL. “In business, we are terrible storytellers about where we want to go. Sixty-page PowerPoints aren’t going to move the needle,” he says. Women Lead: Interactive Talk on Entrepreneurship!